What can a simple postcard teach you about moisture absorption? Try this experiment yourself to learn several important principals about relative humidity and moisture content. Wood, like many natural products, takes on moisture from its surrounding environment. Even when protected from liquid water and sunlight, wood will absorb and release moisture in the form of vapor, thereby swelling and shrinking as relative humidity changes. For optimal stability wood needs to achieve, and stay at, equilibrium moisture content. That's when the wood is neither absorbing nor releasing moisture. Wood is subject to both seasonal and daily changes. We’ve all seen gaps in wood flooring in the winter, that’s from seasonal change. A long hot shower in the winter dramatically increases relative humidity in a bathroom which affects wood products, that's daily change. Substantial daily changes are a concern for interior wood products, since these changes in moisture content may result in dimensional instability. In addition, the faster the wetting or drying of the wood, the more likely wood is to warp or cup. It’s important to understand that changes in moisture content cannot be prevented, only slowed. By retarding daily changes to moisture content, it’s possible to mitigate any negative repercussions. This is where the postcard experiment beautifully illustrates the effects of dramatic changes to moisture content. Take a normal postcard, one side has an image protected by a plastic coating, while the other side is left uncoated to make writing possible. 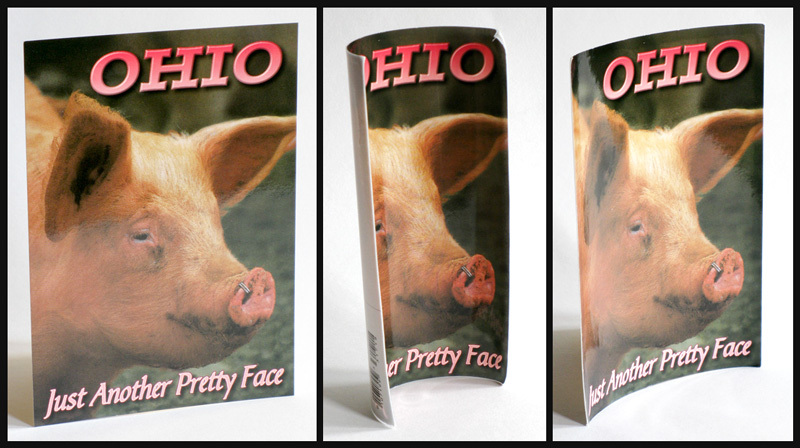 Look at the left-most image in the photo and you will see our beautiful pig postcard is nice and flat. Dip the postcard in water for 5 seconds then remove it, holding it from the top edge. You will soon see the card start to curl, and after 30-60 seconds, it will nearly curl in half as shown in the center image. Stop right here and ponder what this experiment has taught you so far. First, you see an example of how unprotected wood fibers can rapidly absorb moisture. Second, you see dramatic differences between the protected side and the unprotected side, the result of these differences being severe cupping, a form of dimensional instability. Now granted this is an extreme illustration, but it highlights an important principal that construction professionals need to observe: to prevent rapid changes to moisture content, provide wood products with comprehensive, balanced protection. Now look at the right-most image in the photograph, notice that it's slightly cupped. That image was taken when the card was completely dry, 24 hours after it was dipped in water. Additional time will not result in further flattening of the card; it will not return to the original flat shape. This is the final lesson to be learned from this experiment, wood fibers will “set” when dry. That is why so much care is taken in kiln drying wood, because improperly dried wood is warped, cupped, twisted, and split. Alright, so now that you understand these principals you need to consider the practical applications (and implications). All wood products need to have comprehensive, balanced protection to effectively slow changes in moisture content. That means all mouldings and millwork should be primed or sealed on all faces and edges prior to installation. Furthermore, all end grain must be sealed, that means having the trim installer prime or seal the square and mitered cuts before assembly. This is very important because end grain absorbs moisture 10 times faster than edge grain, and let’s face it, a miter joint is the last place you want to see dimensional instability. Construction sites are notoriously humid places because framing lumber, concrete, and plaster are all releasing moisture into the air as they dry. This increases the relative humidity, which affects the moisture content of wood. Relative humidity at construction sites can sometimes reach extremely high levels, up to 80 or 85%, high enough to possibly warp your millwork and far too high for maintaining tight joints. With that in mind, below is a list of recommendations for construction professionals to minimize potential problems associated with changes in moisture content. This article is simplified and condensed. For more in-depth information about this subject, visit the Forest Products Laboratory website. Download their 500-page Wood Handbook or simply download chapters 4, 13, and 16 that deal directly with this topic. A special thanks goes to Chris Hunt at the Forest Products Laboratory for his insight and technical advice.